Easter is approaching, and of course this means spring break is on its way, too. Other than Myrtle Beach (to which I never went for Spring Break), this makes me think of swimwear! While I may not be bikini ready (unless you're into wobbly, lumpy, spinsters), that doesn't mean I can't dream of a much younger time when wearing a swimsuit wasn't frightening. 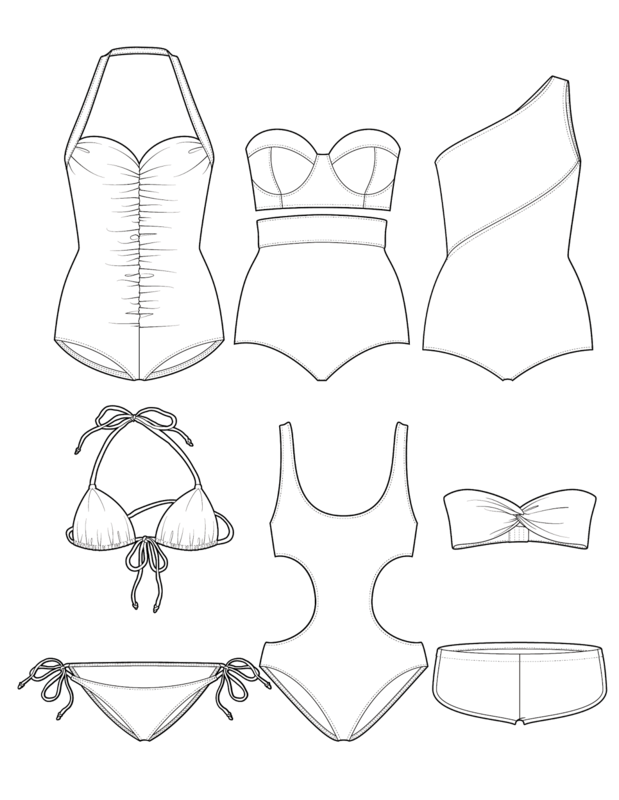 Currently I design boys' swimwear, but I thought since this is a Spinster Blog, I'd go ahead and give you a coloring page of women's swimwear. This way, you can pretend you're designing your very own swimsuit by adding whatever colors, [cat] stickers, glitter, wash, or what have you to your swimsuits. It'll be therapeutic. This page should print out nicely on an 8.5 x 11 page, so you won't need to struggle with weird paper sizes and placements. Get those crayons, colored pencils, watercolors, and/or markers out, and get to work! Next thing you know, you'll be on Project Runway: Spinster edition.